We had a few days of record heat, then rain, and cooler. The plants are dealing with this variable weather better than I am. At least I don’t have to water anything myself! New flowers are blooming nearly every day. So much to do, and only so many hours of agreeable weather. Not a lot of blossoms on this tree peony, so I savor every one. These photos are of the same flower, on the same day. They open fast in the sunshine. I did cut a couple of these flowers, just as they began to open. They are hanging in a closet, clothes-pinned upside-down from a hanger. If my experiment works, I’ll have some peonies all summer – or maybe even longer! Lots of white Dutch iris, I like these a lot. Rhododendron flowers open in the same order every year. Weigela is an old-time shrub, and new to my garden. This particular spot can get very wet during rainy season, and I’ve lost a few plants here. Upon investigation, I determined that this is a prime candidate to like this location. It sure looks good now, I do hope it stays around. Categories: Uncategorized | Tags: bi-color leaf, bluebells, dried, Dutch, flowers, iris, peony, rhodie, rhododendron, tree, tulips, weigela, white | Permalink. We came home to thigh-high grass in the fields and the back yard. I am so looking forward to planting my vegetable garden. So much to do . . . . 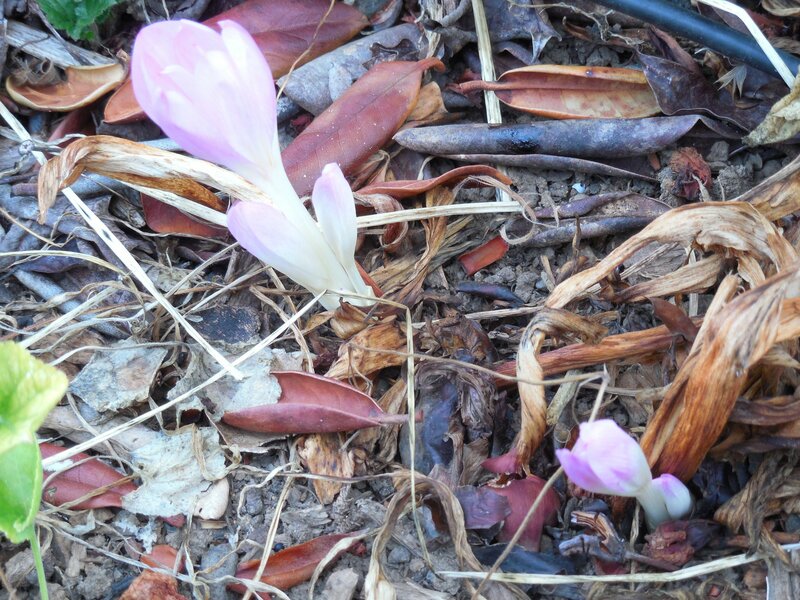 The flowers are blooming, it is always interesting to see which ones are doing great, and who is faltering. 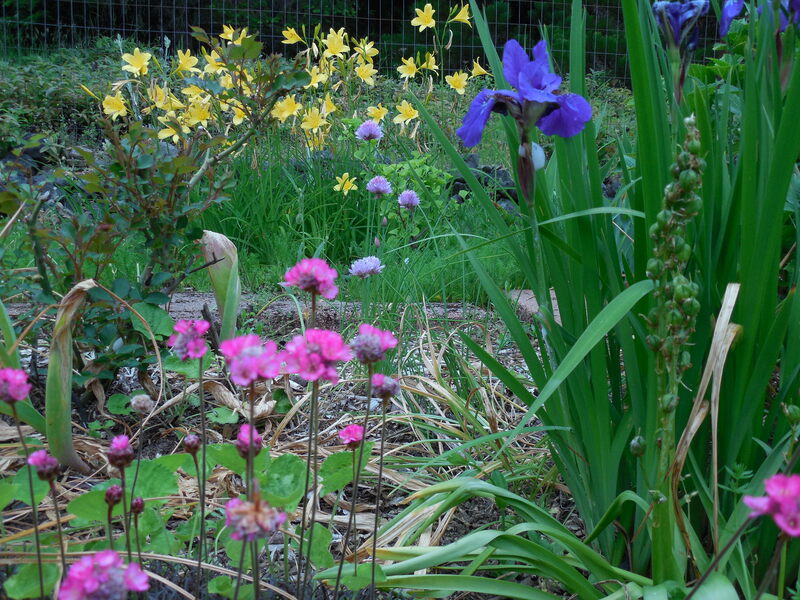 In the top photo, small, pink Armeria fronts pale pink chive blossoms, yellow day-lilies in the back. 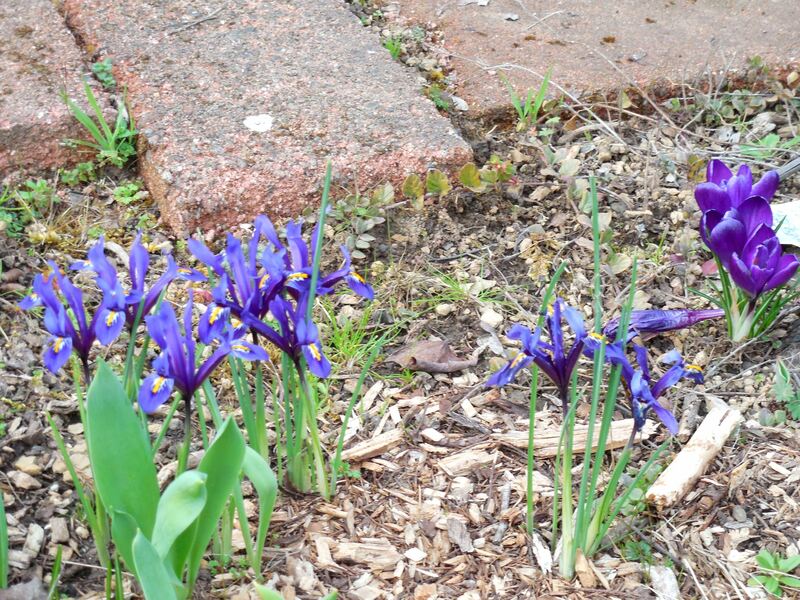 Dark purple Dutch iris on the side. 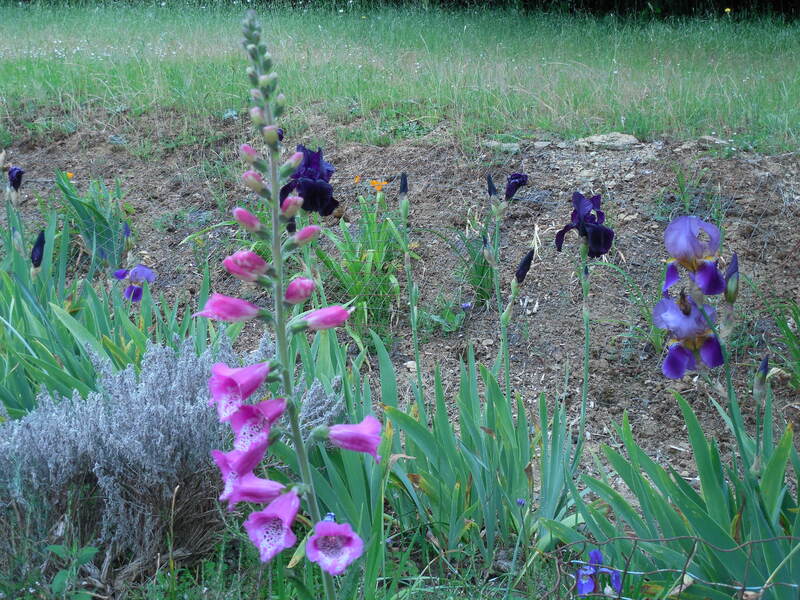 Bottom shot is a Foxglove with bearded iris, and a California poppy in the background. We arrived home in a slight drizzle, but the ground is hard, so it is time for the irrigation to be set up. 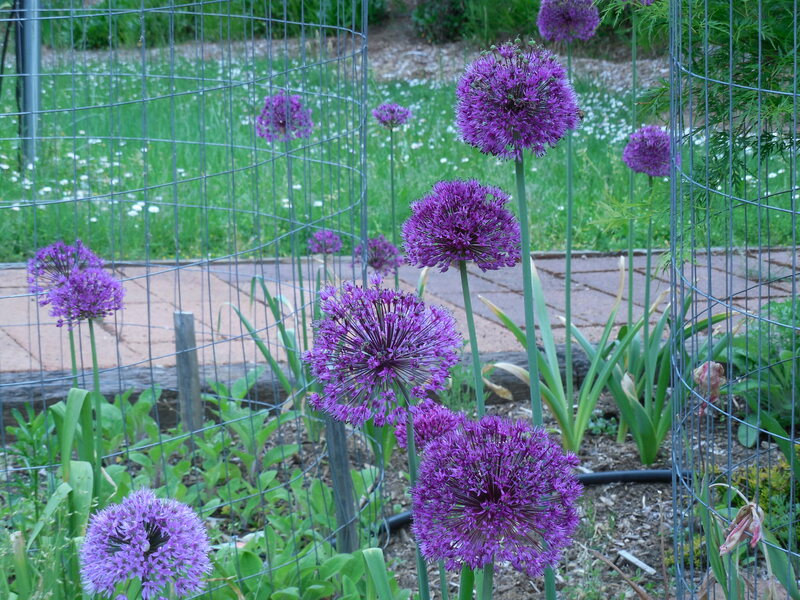 The alliums have multiplied, look great and will keep the deer from this bed (for awhile, at least). I don’t know if it is the weather, or the fact I finally weeded around these iris, but this is the best they have looked ever! On another positive note, our sugar maple tree leafed out while we were gone. We really thought it had given up the ghost and was a goner, it should have come back to life before we left. We must be getting old and totally mis-judged when it springs back to life. Categories: Uncategorized | Tags: allium, armeria, bearded, chives, day lilies, Dutch, foxglove, iris, pink | Permalink. Where to start? 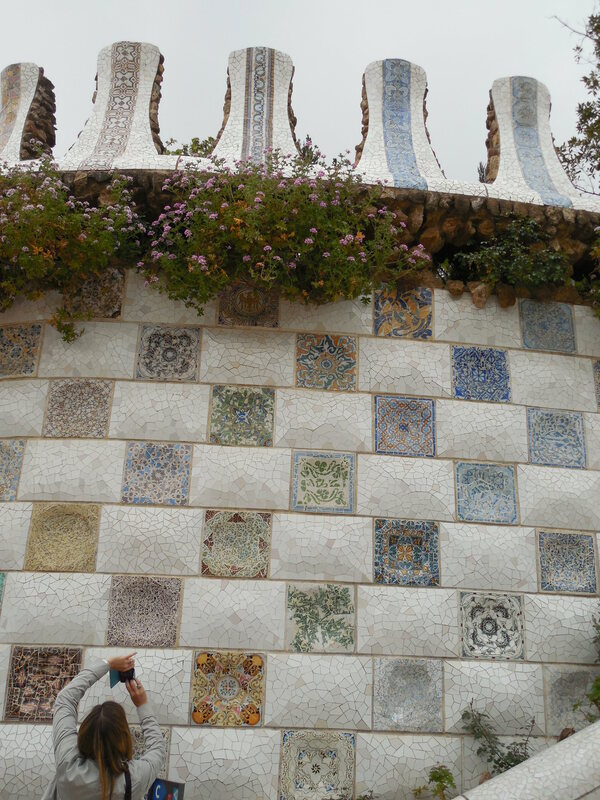 Gaudi was such an amazing architect, and his park/gardens do not fail to amaze. There is a free admittance and a pay admittance area, needless to say, we saw this in the free section. 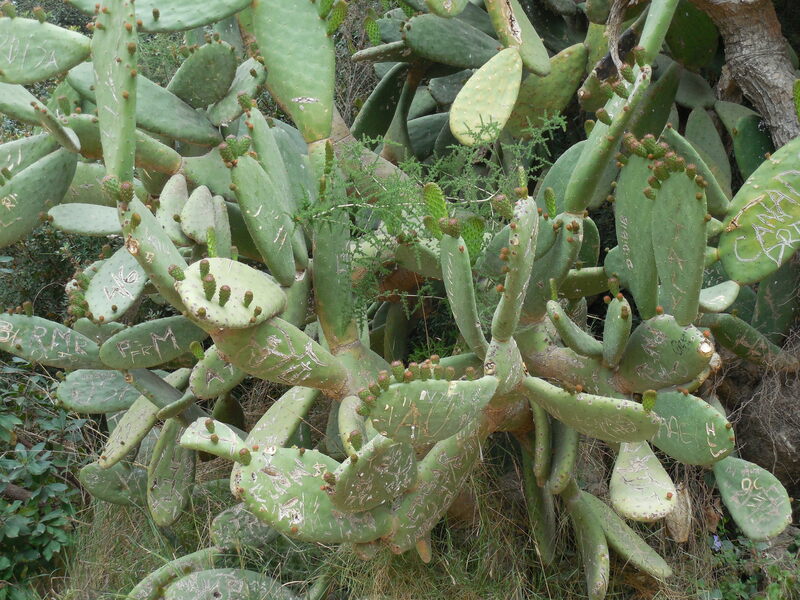 People had felt impelled to carve into cactus and we also saw the same vandalism on some wide aloe-type fronds. But only at the entrance, the rest of the park was saved from such defacement. As we walked into the park, the aroma was almost overpowering. Perhaps it was the direction of the air. Are these gardenias? That is my guess. They are too tropical to live in my home climate, so they are a novelty to me. 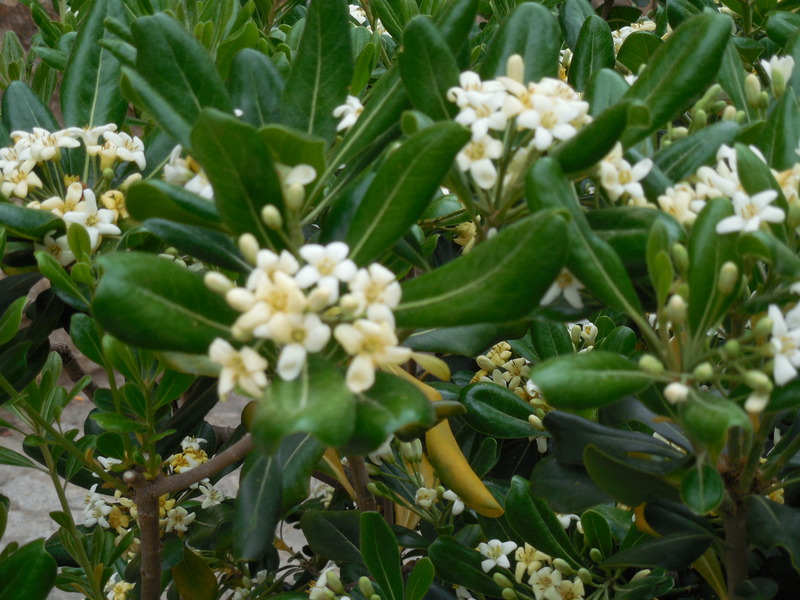 I sure loved the scent. 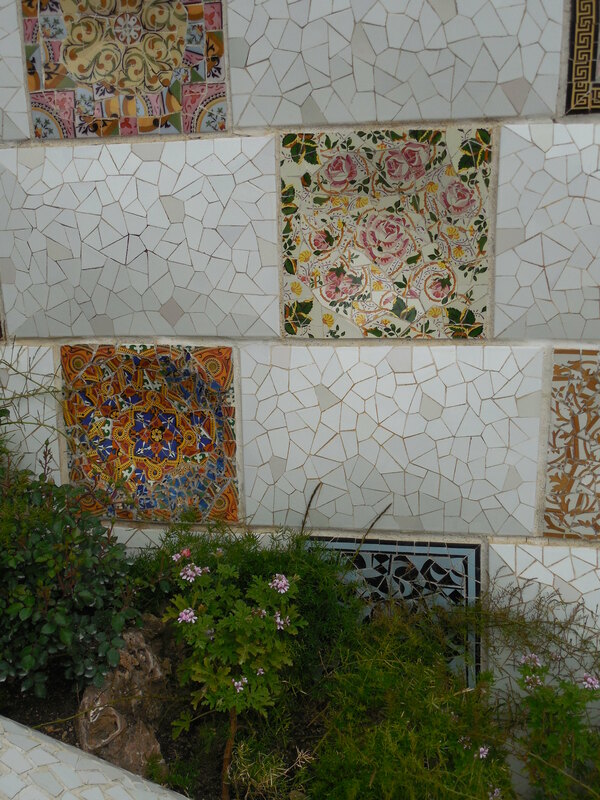 A wall of tiles, I liked the proximity of real flowers to the images. 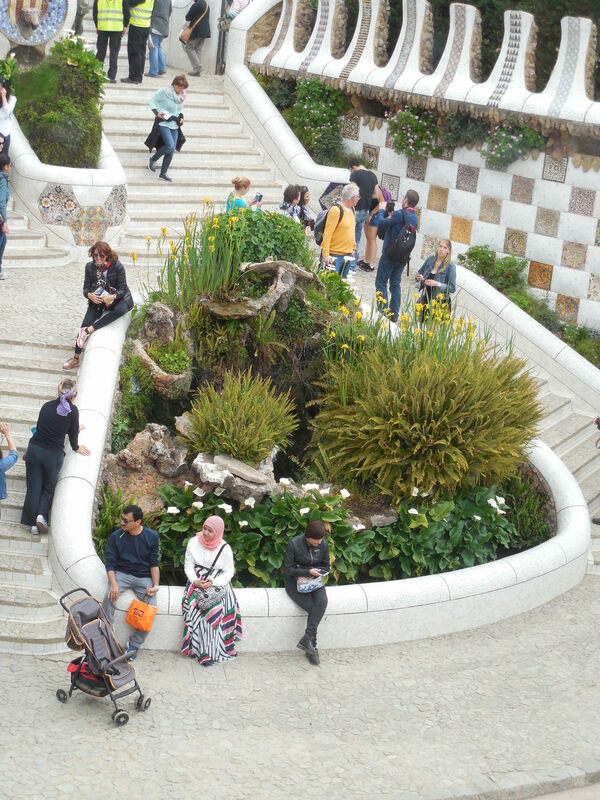 The lizard and calla lilies are just above the trickling spring with ferns and flowers, as one walks up a stairway. 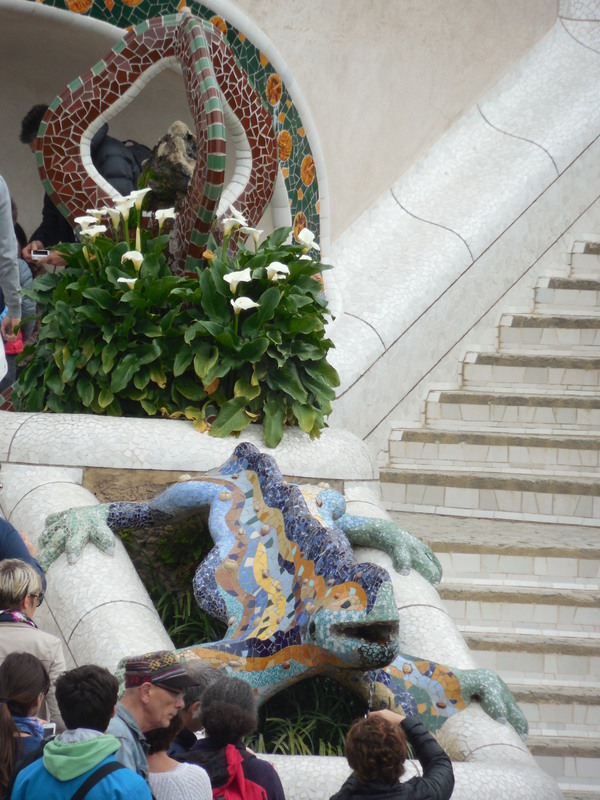 Many tourist cards display the infamous, brightly-tiled chameleon. Calla lilies are planted to show in a ring sculpture above him. Below the lizard, a small spring and pond are planted with yellow Dutch iris and calla lilies, along with some ferns. Our last views before leaving these magnificent gardens were of banks of various flowers. 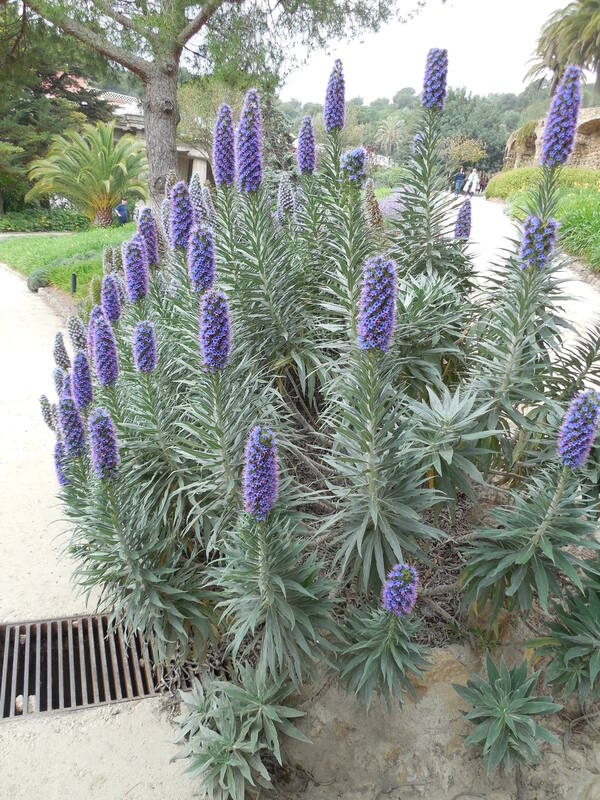 Day lilies and lavender I recognized, but these purple spiky flowers are foreign to me. 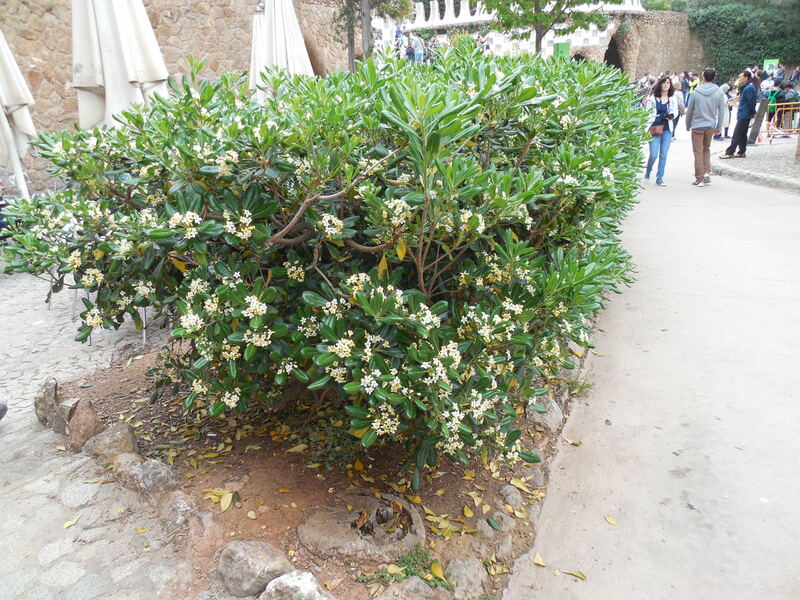 I have shared some photos of flowers from this amazing park, another UNESCO World Heritage Site. It is really famous for the architecture, which is most unusual and well worth a visit. Categories: Uncategorized | Tags: aloe, aroma, Barcelona, cactus, calla lilies, chameleon, daylilies, defaced, Dutch, ferns, garddenias, Gaudi, Guell, iris, lavender, lizard, mosaic, park, scent, spring, tiles | Permalink. 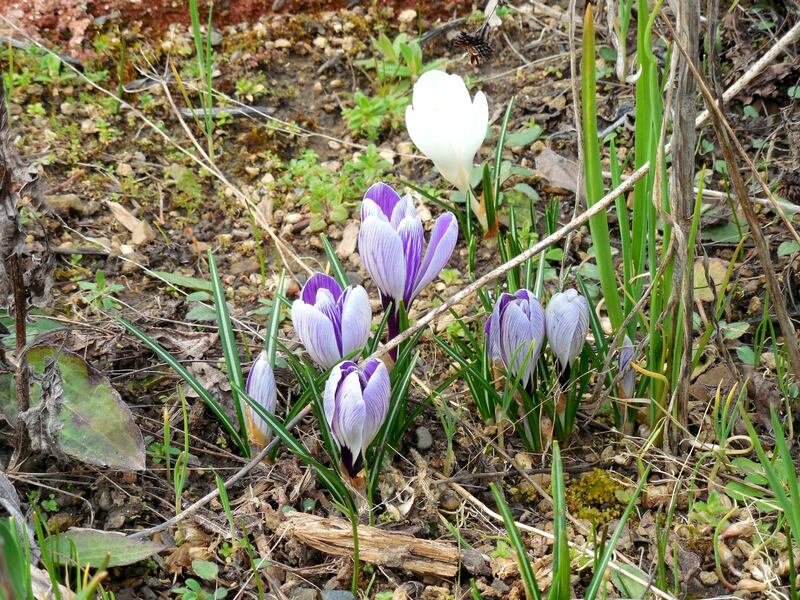 With some warm days, early spring flowers have come into full bloom. 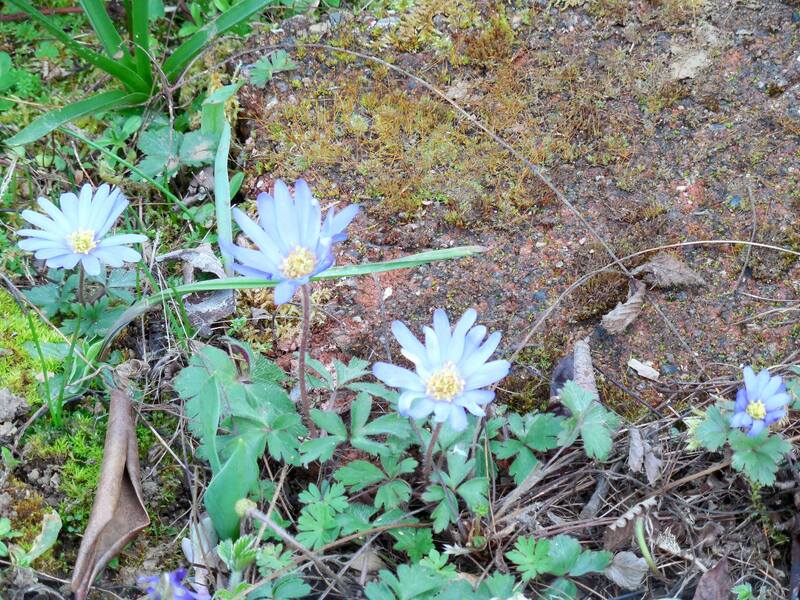 These windflowers close up overnight, and in cool or wet weather. But when the sun emerges or even on an overcast afternoon, they open to the warmth. 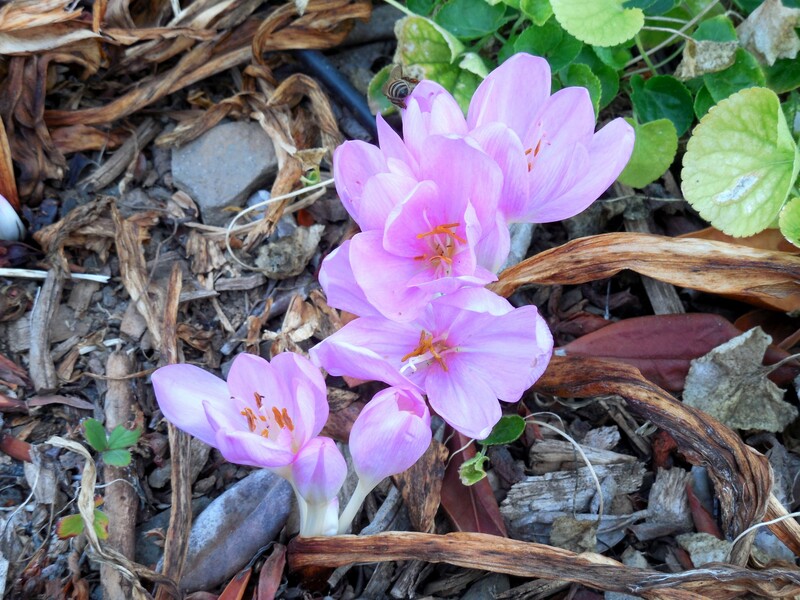 It will soon be time to move crocus bulbs around. 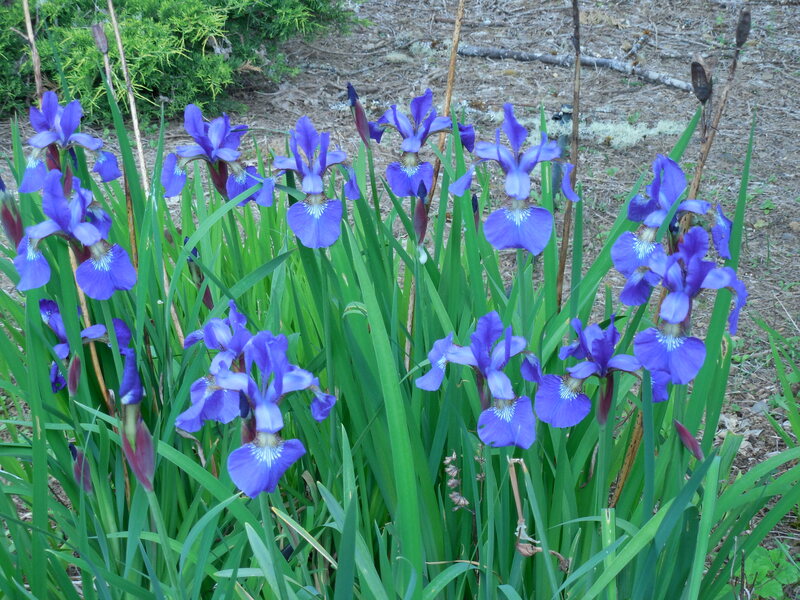 Unlike most other flower bulbs, they are amenable to a change in location as soon as the flower dies, but before the leaves do. Categories: Uncategorized | Tags: bulbs, crocus, early, flower, iris, windflowers | Permalink.